I learned a trick that has dramatically improved my summer pizzas topped with fresh sliced tomatoes: just let them hang out for a while. Previous attempts at fresh tomato and basil pizza tended to result in wet tomatoes and dry basil. Not a good combination on a pizza. I cracked the fresh herb code [did you know there was a fresh herb code? Now you do] with my Fresh Herb Pizza, so I figured it was time to crack the tomato code. The Illuminati are not involved. Just time and a bit of salt. This is a simple technique I can incorporate into my everyday fresh tomato usage. I slice a tomato, spread the slices out on a cutting board, and go do something else [sometimes Pinterest, sometimes Facebook, sometimes cleaning but most often nagging facilitating my kids' finishing their summer classwork--since I'd like to enjoy summer before school resumes]. After about 10-15 minutes I may sprinkle a pinch of salt or a shake of Crazy Jane's over top. Then I let the slices sit for another spell, 5 to 10 minutes, until I'm ready to use them. I tip any accumulated juices into the sink and the tomatoes are good to go. I use these tomatoes in sandwiches, on burgers, in omelets, and this pizza. This technique of doing a bit of preparation and then walking away for a while has excellent results in my Soaked Oat Muffins as well as Waffles and even Pizza Dough. But enough cross linkage action--back to today's pizza. When I'm making pizzas with simple fresh ingredients, I like to dress things up a bit with olive oil, salt, and freshly ground pepper. In the instructions below you'll see a change from my usual pizza methods--after baking I finish the pizza with a drizzle of olive oil and a sprinkle of salt and pepper. You can skip this step, sure, but I felt the flavors of the tomato and basil were enhanced with these actions. Any old crust ought to do, but I had time and buttermilk on my hands so I made a quadruple batch of Buttermilk Pizza Dough (using ⅓ whole wheat and the rest all purpose flour). When I make a bunch of pizza dough, I stash the dough balls in the freezer and just pull out one the day before to thaw in the fridge. For general hints, tips, and photo collages please check out my Pizza Primer post, a brain dump of all things related to making pizza in my home kitchen. For a photo album of pizza dough troubleshooting tips, please see my FB page. Preheat oven to 450 degrees Fahrenheit. If you've got a pizza stone, rock on with that bad boy and let it preheat as well. If not, no worries, use a cookie sheet. 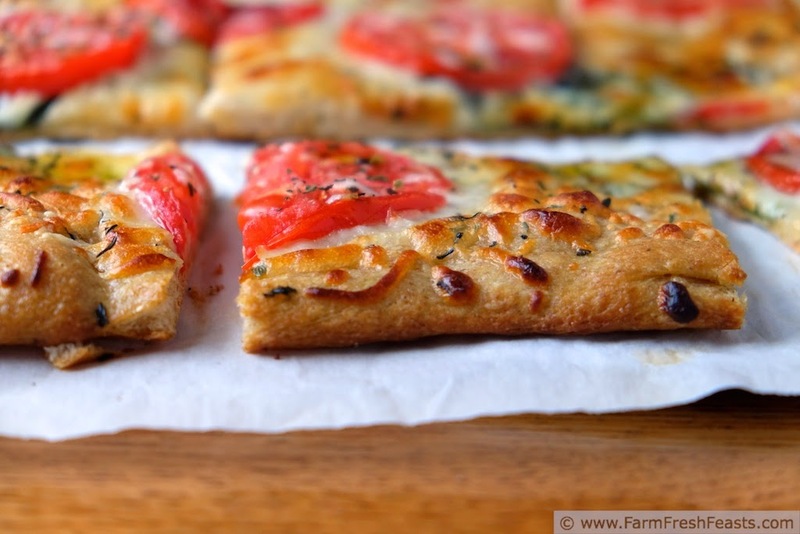 Slice tomato into thin slices and spread out on a cutting board or plate. Set aside for 10 to 15 minutes while you work on other things. Sprinkle with a pinch of salt, then leave for another 5 to 10 minutes until you're ready to use them. On an oiled piece of parchment paper stretch out the dough into whatever position you can convince it to assume. Brush with olive oil. Place basil leaves on dough, and brush again with olive oil. Sprinkle about a cup of mozzarella cheese over basil, then top with drained tomato leaves. Top with Italian seasoning blend and the rest of the cheese. 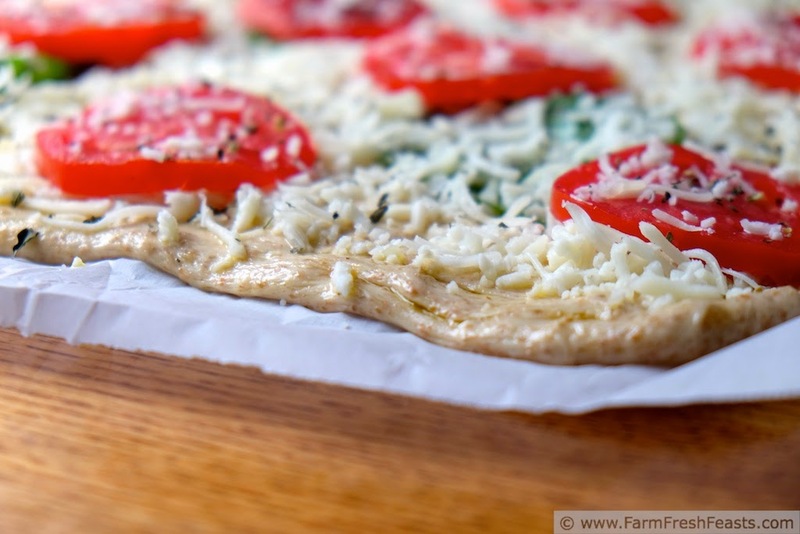 Bake for 5 to 8 minutes on the parchment paper, then shimmy the pizza crust off of the paper and bake directly on the stone until the cheese is browned and bubbly, another 3 to 5 minutes. Remove from oven and brush the edge of the crust with olive oil [trust me, you don't want to use your fingers for this step because you're too lazy to wash the brush from last night's grilled chicken]. Sprinkle with a healthy pinch of kosher salt and several grinds of pepper, cool on a rack, slice and serve. Heck YEAH! 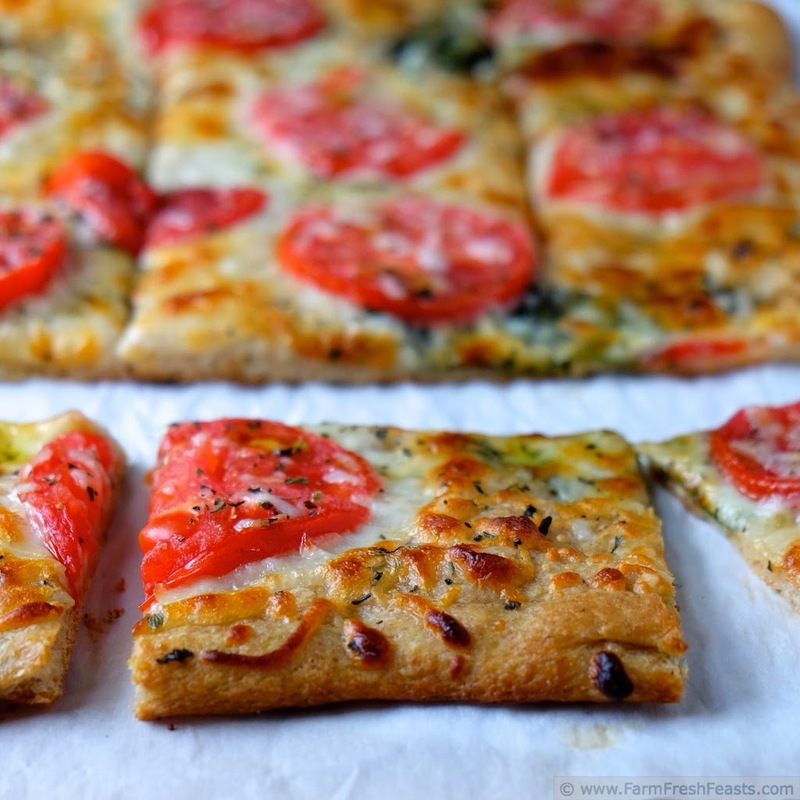 I love a good fresh Summer tomato 'za! And you're totally right - letting them hang out allows everything to settle and mingle and become super duper awesome. PS. I regularly drizzle olive oil on just about everything I make. It's one of those things that if you invest in, and get the best quality stuff you can afford, adds tremendous flavour. I'm a big fan of a spicy peppery Italian one and a more frisky (yes, frisky) fruity one. It's so good, I could just drink the stuff outta the bottle. PPS. Why does google insist on telling me I've spelled words incorrectly when I clearly and Canadianly haven't?! Rawwwwr! Clearly and Canadianly! Love it! I just picked up some white truffle oil that I am drizzling on stuff. I'm pretty pleased with how this turned out. Yes! 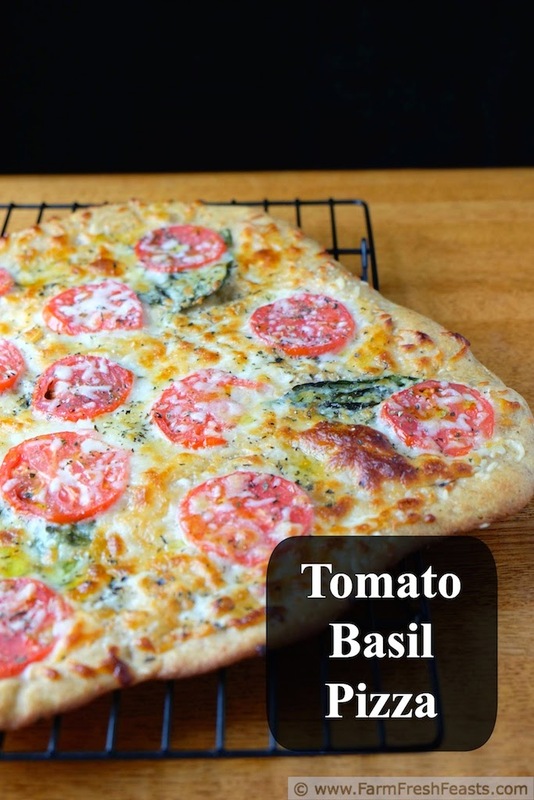 Love the tip - tomato and basil pizza is my absolute favorite! Classic combos are just that for a reason. Sometimes the simplest ingredients net the best results. You make me want to jump back on the pizza crust train, as in actually try to make it myself. Whenever I do my caprese salads, I always toss a grinder of salt and pepper on the tomatoes and then let them sit. It brings out all the juicy flavor, and who doesn't like that. No one, that's who. No one who's not anyone doesn't like that. Or something. I tell ya, using that pizza crust yeast is pretty much foolproof if it's 2 hrs before you want to eat and you're without a crust. In the Northeast our tomatoes are just getting ripe. 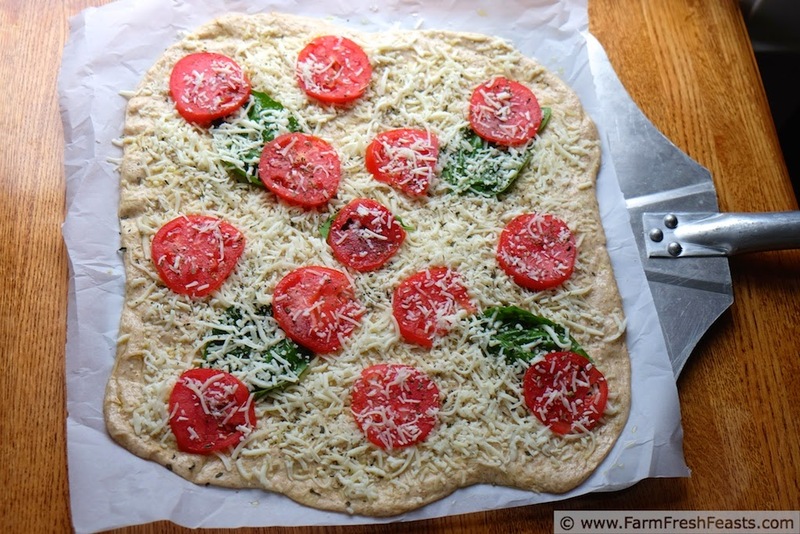 I can't wait to try your tomato and basil pizza, so fresh right out of the garden. Thank you for sharing with the Clever Chicks Blog Hop! I hope you’ll join us again next week! Don't ya just hate how it's felt like summer for weeks and weeks but no ripe tomatoes? That looks absolutely phenomenal... PERFECT for garden fresh tomatoes! Yumm! Fresh tomatoes need so little to showcase their flavor. This type of recipe is just easy.